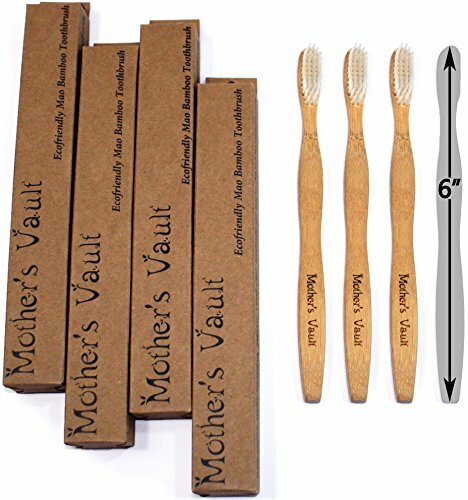 Mother's Vault Biodegradable, Eco-Friendly Bamboo Toothbrush (Children's 6inch) w/ BPA-Free Soft Nylon Bristles - Natural Dental Care for Men & Women (4 Toothbrushes) by Mother's Vault at Angels Touch Vegas. MPN: MVCT0040. Hurry! Limited time offer. Offer valid only while supplies last. POLLUTION IS A PROBLEM You know it, we know it, and the world knows it. Isn't it time we started to find better, more natural ways of doing things? You know it, we know it, and the world knows it. Isn't it time we started to find better, more natural ways of doing things? Isn't it time we make our air just a little safer to breath? Why not start the change with hygiene? The Mother's Vault Bamboo Toothbrush is the right step to go green and reduce your carbon footprint while getting the same great results you would with a traditional plastic brush that you're used to using! We've not only found an environmentally better way to brush, but we've done so keeping the integrity of a well known design. We've simply replaced all plastics and non-biodegradable materials with bamboo and nylon, keeping your mouth, as well as the air, clean and fresh! A portion of every sale at Mother's Vault is donated to EarthJustice. EarthJustice is the nation's original and largest nonprofit environmental law organization. Created to protect people's health, preserve magnificent places and wildlife, advance clean energy, and to combat climate change. We love what they are doing to fight for better environmental laws and protect this wonderful place we live in. Remember, we've got your back FOR LIFE! We take the utmost in pride in our quality bristle and brush construction, and we're here for you if you're not happy! BRUSH BETTER TODAY WITH MOTHER'S VAULT, AND CLICK THE "ADD TO CART" BUTTON NOW!! ★ GO GREEN! - Why fill up landfills with plastic when you don't have to? Help the environment, and feel better about your mark on this world with Mother's Vault Bamboo Toothbrush! It's the ecological way to not only keep your mouth fresh for just as long as a normal toothbrush, but help the environment at the same time! Especially since a portion of every sale at Mother's Vault is donated to the Earthjustice charity.These brushes go great with our new peppermint charcoal toothpaste! ★ BEAUTIFUL BRISTLES - By using BPA free nylon, we offer the same great quality and clean that a normal toothbrush does, but without using chemical and toxin leeching plastics! Best of all, the bristles are not too hard, and not too soft, and are well crafted to stay in place and not fall out like some of the other guys. ★ 100% RECYCLABLE - Whether it be used for compost or the recycling bin, this remarkable little brush keeps it's value even when your mouth is done with it. Why spend more money on a brush that is killing the environment? Keep Mother Nature intact, and switch over to the better brush! ALL of our packing and materials can return to the environment safely. ★ STROKE FOR STROKE - Just because we're natural, doesn't mean we don't last as long as those plastic brushes. In fact, we last just as long as the normal standard toothbrush is supposed to (about 1 month) before needing any replacement. Best of all, you can opt for the four pack and keep your healthy brushing habits up longer! It's a fantastic gift for the eco-friendly person you know as well! ★ GUARANTEED - We love this toothbrush, and we're sure you will to. However, if for any reason you don't, no worries! Just send it back our way for a full refund of the purchase price. It's natural quality with an unbeatable guarantee. Why keep looking when you've found your solution right here! If you have any questions about this product by Mother's Vault, contact us by completing and submitting the form below. If you are looking for a specif part number, please include it with your message.